The Golden Child. Paramount Pictures 1986. I first heard of this movie as the project that made Eddie Murphy back out of Star Trek IV. It was probably for the better, since the comedy of that movie comes from the serious characters being dumbfounded by the 20th century, and a wisecracking, street smart native would have made it more farcical. Besides that, I know what the blurb says, about a social worker searching for a Tibetan boy destined to save the world, and I recall there being some kind of prop/replica in the quiet footpath with movie memorabilia at King’s Island before they replaced that area with something more interesting for their target clientele. Probably a gift shop, I don’t remember. In Tibet, the Golden Child, born only once every several thousand generations, destined to save the world by bringing compassion to it, and gifted with telekinesis, the power to reverse death, and the power to turn evil into good by touch, is abducted by Sardo Numspa and his… let’s call them cultists. In Los Angeles, Chandler Jarrell is a professional child-finder. Kee Nang comes to L.A. seeking him out as he fulfills the prophecy that the Golden Child “will be taken to the city of angels and found by one who is not an angel”. Chandler objects to the mysticism he’s presented with and refuses to listen, but he’s already on the case, because the missing teen he’s looking for was killed by the cultists in an attempt to weaken the Golden Child enough to make him killable. He may not believe anything that’s happening around him, but Chandler still tries to do right where an abducted child is involved. It occurs to me that a difference between Fantasy and Science Fiction is that in the latter, characters annoy me by denying all the evidence of the weird thing right in front of them, but in the former, characters’ paradigm shift is often just “but magic doesn’t exist!” “yes it does, see?” “Okay, I take your word that’s not a trick.” This movie puts a sarcastic skeptic (bordering on Naytheist) into an Eastern fantasy world, and he stays a skeptic. Several times, when he’s asked to go further than he wants, he reverts to “none of this can be real, I don’t have to do anything” and has to be further coaxed. It paints a strong contrast with Indiana Jones’s “it’s important to the bad guy, so I need to get it first”/”I have no idea how this is happening, but I can see it doing so and I need to respect the legend” mindset. Eddie Murphy’s character is normally everything his characters normally are. However, there are some moments where he steps up to be heroic that feel like he’s suddenly a very different, unfamiliar person. Charlotte Lewis needs help from her wardrobe to pass for Asian, and her outfits and mannerisms get more Western as the story progresses, allowing me to notice that her appearance is not very Asian (apparently, Irish/Iraqi-Chilean). I enjoyed Charles Dance’s performance immensely, but I would have enjoyed it more if I wasn’t trying to place where I know him from. Apparently, just Last Action Hero. I would have thought I’d seen more of him than that. His character has an odd habit of consciously avoiding J-sounds, which is never explained. Since he’s a demon, my first guess is that it has something to do with the J of Jesus or Jehovah, but there’s nothing particularly Judeo-Christian about the mythology otherwise. The effects were somewhat mixed. The sparks that jump between the Golden Child and the things/people he uses his touch-based power on are very nice, and the dead animals turned to life are excellent for the time. My biggest complaint is that Sardo’s demonic form looks too much like the clay or rubber model that it is to be given the lengthy closeups it does. Suddenly a charismatic, deliciously evil Brit just gets replaced with Gumby’s nightmare. This was a pretty enjoyable 80s Eddie Murphy film, but I can understand why it’s not a classic. The demands of the genre don’t line up with the character Murphy wants to do, and the humor can clash with the fantasy. It’s not as dated as it could have been, but it still shows signs of age. 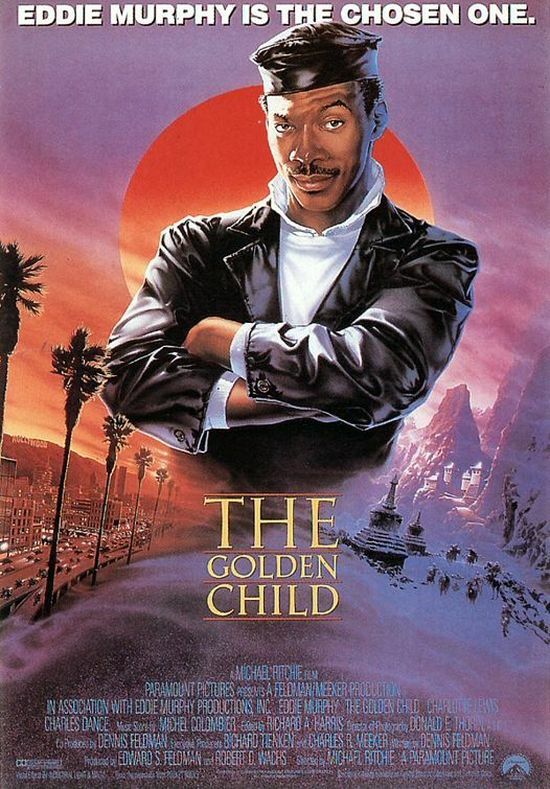 Watch this movie: to see Eddie Murphy dramatically drink a glass of water! Don’t watch this movie: for very sensitive depictions of Asian culture. I’ve seen this at the video rental store but never really thought much of it. Might go check it out now. Pity the film seems to operate on the idea that the audience knows nothing about Tibet. Then again, I really don’t know anything about Tibet. Ah, you win this round, film makers.